BTW - I don't think I like the word "slaw." That was the last email I sent from work today. Um, yeah, I was definitely feeling squirrel-y and ready for the weekend to start! So, it's Friday evening (yay!) 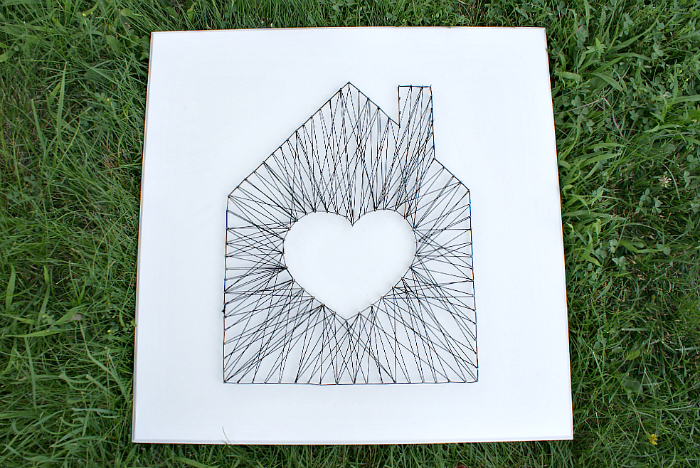 and I'm excited to be sharing the details of this string art project I've been working on. It was super easy, but it took me all week to complete because of a sweet little boy I want to snuggle, a career I love, sleep I need and all that stuff that gets in the way of crafting. Can I get a virtual high five for finishing this project and taking a somewhat decent photo of the end result?! Thanks. I needed that. To make this modern-ish string art, I started with an old wall decor piece that I bought years ago. I had it stashed in our basement and came this close to tossing it several times but I'm so glad I didn't! With a few coats of leftover white paint, it became the perfect canvas for this project. 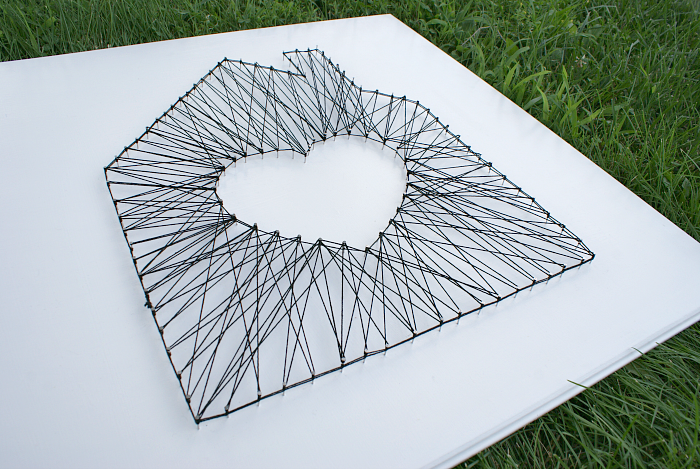 After I painted the panel white, I made a template for the string art house and heart using black poster board and chalk. 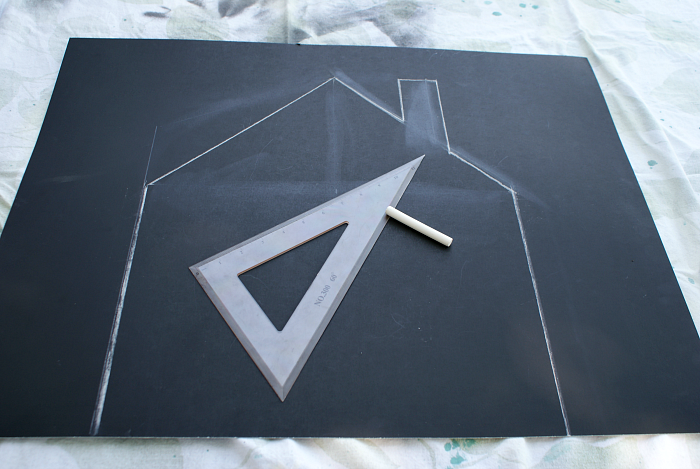 Then I used a utility knife pressed against a straight edge to cut out the house and plain 'ole scissors to cut out the heart. Once it was cut out, I used a measuring tape to find the center of the panel and then secured the template place using doubled over painter's tape. This kept the template from wiggling around when I hammered in the nails. After the house and heart were outlined with nails I removed the poster board and went to town with some black string. These pictures are awful, but it was ten o'clock at night in our kitchen and whaddya do? I wanted to include these photos to show how you have to make a loop around each nail. The string part is simple; tie a knot around one nail and then go back and forth from the house to the heart creating different angles and looping the string around the nails until you've gone around the entire thing. Easy peasy. There you have it! A fun little art piece that cost less than five bucks! It was so simple to make, I wish I'd tried it sooner. I think I could have done this start to finish during a Saturday nap time. I also think it would be fun to make these as gifts because you could make so many different shapes, words, colors, etc. 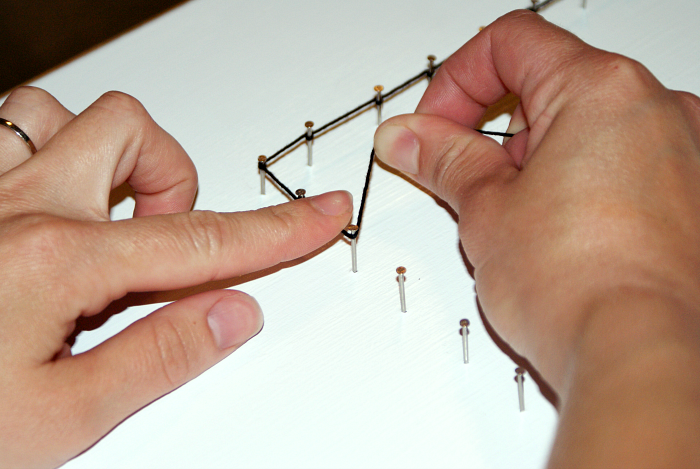 Have you tried making string art? I'd love to hear about it in the comments! Great job! I love the clean and modern look. You could customize this project in so many ways-- different string, different shape, different background. Thanks for the inspiration!